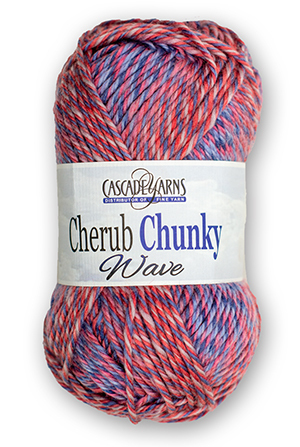 Cherub Chunky Wave is the bulky version of our Cherub family yarns with a new color shift effect. It's machine washable and machine dryable! It is an ideal mix of acrylic and nylon, making it soft and durable. This yarn is perfect for baby and kid apparel, blankets, and other hard-wearing hand knit or crochet items.